The EagleEyesTM FPV Station integrates the main components you need for FPV on the ground, at a cost that’s lower than many of the individual units available! 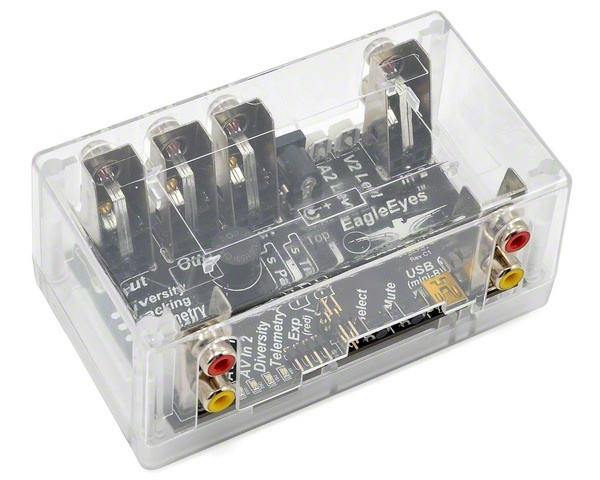 * Receiver Diversity – when you connect two NTSC or PAL audio/video receivers to it (of any frequency), the EagleEyesTM picks the better signal at any given time, which can greatly reduce video fades and improve your FPV experience! A variety of diversity settings are configurable with the on-board switches and LED indicators. 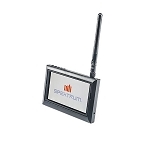 * Antenna Tracking – when coupled with our OSD Pro, the EagleEyesTM is the heart of a full-featured pan/tilt antenna tracker. Powerful, easy to use menus are provided for adjusting the EagleEyesTM to work flawlessly with the tracker of your choice. ReadyMadeRC.com produces a low cost, high quality tracker. The built-in regulator drives even large pan/tilt servos, with no need for an external BEC. * Telemetry – When coupled with our OSD Pro, all Eagle Tree data (not just GPS position) are transmitted to your laptop, via your video transmitter and the EagleEyesTM USB port (separate USB cable required). Your flight can then be graphed and displayed with our powerful software, or visualized (either in real time or after your flight) with Google Earth! * Four Channel A/V Distribution – Ever wish you had more video/audio outputs? The EagleEyesTM has four built-in outputs! * Programmable Low Voltage Alarm – How is your ground station battery doing? Now you can program a low voltage alarm buzzer, which alerts you when your battery is below your chosen voltage. The buzzer can also be programmed to alert for other conditions, such as poor telemetry signal. * Two video inputs -NTSC/PAL, using your video receivers of any frequency. Video Input 2 is adjustable to match Video Input 1. * Two audio inputs – Two monaural audio inputs are supported. Audio Input 2 is adjustable to match Audio Input 1. * Power Input – Power input range approximately 6V to 14V. Barrel style power input with standard 2.1mm center pin. * Two Servo Outputs for pan and tilt trackers – Unit is capabable of delivering 5A burst output to drive even large pan/tilt servos. * USB Port for connecting to PC, for live PC display of telemetry and firmware update. Note: A standard USB “Mini-B” cable required for these features, but not included.